For more than a decade, Marion Jones was hailed as the "the fastest woman on the planet." At the 2000 Olympic Games in Sydney, Australia, she became the first woman ever to win five medals at one Olympics. That same year, the Associated Press and ESPN named her Athlete of the Year. She was on the cover of Vogue and Time. She seemed to have it all-fame, fortune, talent, and international acclaim. Now she is a convicted felon. The trouble started in 2003 when she lied to federal agents about her use of a performance-enhancing drug and her knowledge of a check fraud scam. In 2007, no longer able to live with the lies, she admitted the truth. In a sad end to what seemed like a storybook career, she was stripped of her medals, and her track-and-field records were wiped from the books. She was incarcerated at Carswell federal prison in Fort Worth, Texas-a prison known for its violence and abuse. While there, she kept herself in shape and her sanity intact by running on a dirt track and a treadmill in the prison's improvised weight room. But her imprisonment was not the end for Marion Jones. In fact, it marked a new beginning. She is now using her story to change the lives of people the world over and inspire others who, like her, face obstacles that seem insurmountable. 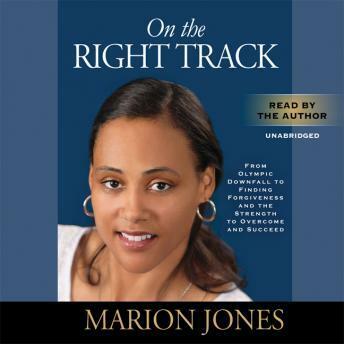 On the Right Track is the candidly told story of how Marion came to grips with her lies and the consequences of her actions, and how she found meaning in all of it. What she tells her children and has now applied to her own life is that when you make a mistake, you admit it, you accept the consequences, you move on, you make the wrong a right. She teaches her children and others to take a break and pause before making impulsive and potentially harmful decisions. At the heart of this book are real issues that we all face: learning to grow through pain; making decisions that will help us far into the future; overcoming failure and discouragement; and applying practical principles that point the way to personal and spiritual breakthrough.